The delivery of the Regional Program follows a developmental learning approach, beginning with the discussion of the concepts and philosophies in organizational excellence. This is followed by theme paper presentations on Strategic Planning and intensive discussions regarding the challenges and opportunities for Regional Accreditation among TVET institutions. This approach is used to lead to a comprehensive understanding of organizational excellence. 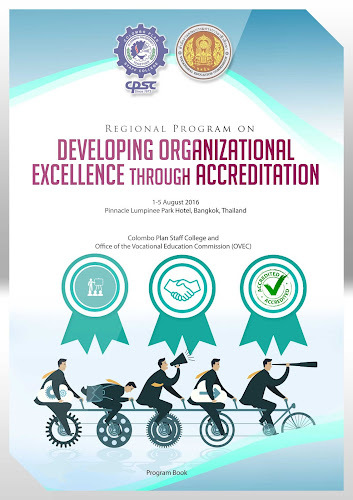 In addition, site visits to the headquarters of OVEC in Bangkok and some private TVET colleges are added in order to expose the participants on the practical applications of organizational excellence and showcase some of the host country’s best practices on TVET institutional management. Finally, a self-propelled learning approach through the preparation of a system development plan integrating accreditation to TVET management for the achievement of organizational excellence will be done by the participants in order to have a tangible transfer of learning from theory to paper. This will be used by the participants to transform the lessons of the program to practical applications in anticipation of future accreditation activities that they will pursue. The participants will also be attending and present country presentations during the International Seminar on "Organizational Excellence in TVET through Accreditation".